As an app owner it’s important to monitor how your app is being used. 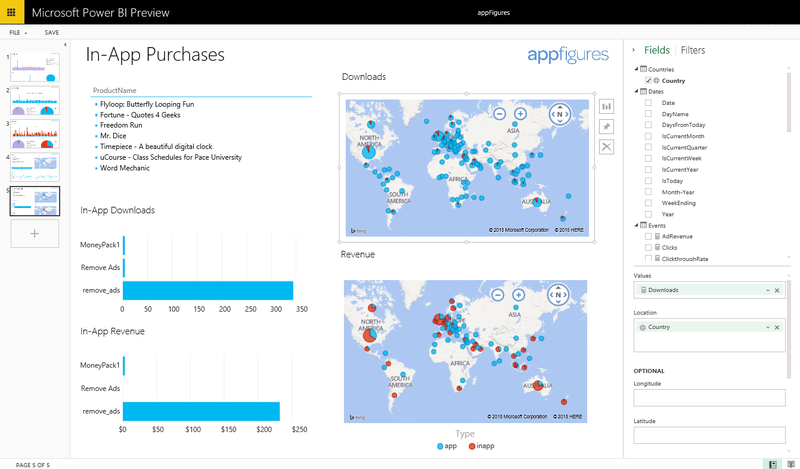 Tracking important statistics about your apps is easy with Power BI and the appFigures content pack. The content pack connects through your account to important data provided by appFigures. The out-of-box dashboard, reports and dataset allow you to retrieve data including app sales, downloads, and ad statistics which are used to populate a default dashboard and related reports. In this post we’ll cover how the Power BI content pack helps you to get better insights into your appFigures data. 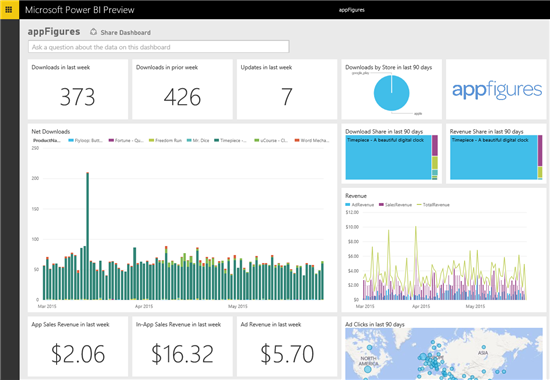 For additional details on how to connect and get started, see the appFigures content pack for Power BI. The content pack brings in all data for all the apps you have visible and active in your account. Simply connect through your appFigures account and provide access to Power BI. After you have created the connection, a dashboard with a variety of insights is automatically created for you. Depending on the size of your data it may take a couple minutes to load. You can explore your data by selecting any of the tiles to drill into the underlying report. Hovering over any of the items provides more details. For example, hovering on the Net Downloads column chart on the first page, you can see the date, product and net download value. You can also select a particular entry, such as product name, to cross filter the other visuals by that selection. The filter pane allows you to change the slice of data you’re viewing. Switching into edit mode, you can view all the fields available for your reporting. You can edit or remove existing visuals and add your own. Pinning visuals will load them to your dashboard. You can fully customize the dashboard to meet your needs, including rearranging and changing the size of the tiles. The dashboard updates daily, ensuring you’re monitoring the most up to date data. 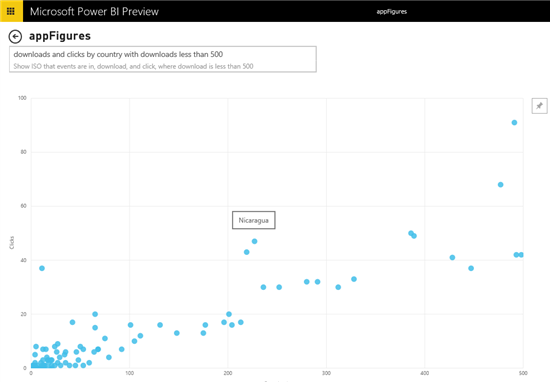 Continue exploring your data to gain the most insights into your appFigures data with this Power BI Content pack. 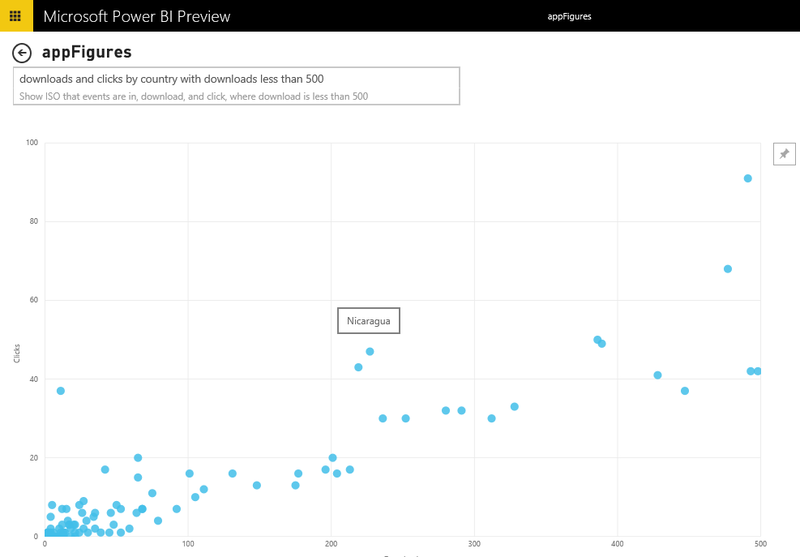 You can also try asking a question of your data – such as “what are the downloads for Freedom Run in the last 90 days” or “show downloads and clicks by country with downloads less than 500”. Those results can also be pinned to your dashboard. Are you ready to get started? 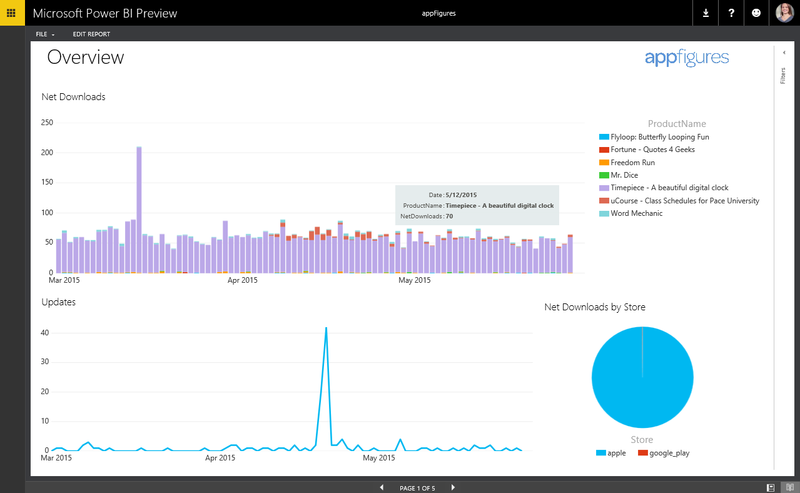 See how to connect to the appFigures content pack for Power BI. Not already an appFigures customer? Go to appFigures to learn more.